This post is part of a series called Science Week. 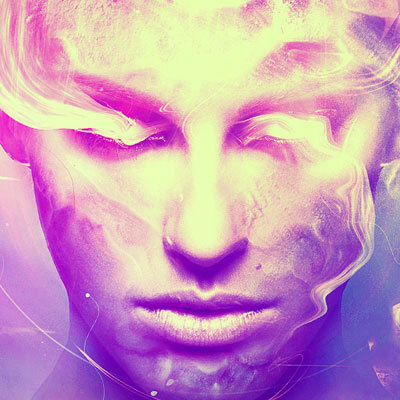 In this tutorial, I'll show you how to use Adobe Photoshop to create an abstract, sci-fi portrait using a variety of photo manipulation techniques. First, we'll build the base scene using a space background and a landscape image. After that, we'll add the model, create several light effects, create abstract elements, add planets, and complete the space background. We'll use several adjustment layers and paint light to complete the final effect. Open the space background images 1 pack. I've chosen a blue one to start with and drag this image to our main canvas using the Move Tool (V). Make a Curves adjustment layer to brighten the space background. On this layer mask, activate the Brush Tool (B) and use a soft round one with black color to erase the top of both sides. We're aiming to make the main light source come from the top middle, so both sides should be darker than that area. Create another Curves adjustment layer to darken the sides of the background. On the layer mask, use a soft black brush to paint on the middle section so it won't be affected by this adjustment layer. Click the second icon at the bottom of the Layers panel to add a mask to the background layer. Use a soft black brush with a lowered opacity (about 20-25%) to reduce the visibility of the stars on the background. Drag the landscape image into our main document and place it in the lower section. Use a layer mask to remove the sky and the mountains on the horizon. Make a Color Balance adjustment layer to change the landscape's color. Alter the Midtones and Highlights values, and on the layer, use a soft black brush with a lowered opacity to reduce the magenta on some shadow areas. Create a Curves adjustment layer to darken the landscape. Use this layer mask to reduce the dark effect on some bright details of the surface. Cut out the model and place her in the middle section. Use a layer mask to remove the hard edges of her body and blend her face with the existing background. Create a Curves adjustment layer to reduce the lightness on the model's face. On this layer mask, paint on the top and lower section of the face to decrease the dark effect there. Activate the Dodge and Burn Tool (O) with Midtones Range, Exposure about 5-10% to refine some details on her face. You can see how I did it with Normal mode and the result with Overlay mode. Open the light images 1 pack. I've chosen image 03 and placed it on the main canvas. Go to Filter > Liquify Tool and select the Twirl Clockwise Tool (C). Use this tool to tweak the image into a twirl one. You should get a similar result to the one shown below. Change this layer mode to Linear Dodge 100% and use a layer mask to remove the hard edges and leave the twirl visible softly around the model's face. Use this image again and tweak it to get similar results to these ones, and place them onto the eyes. Alter these layers' mode to Linear Dodge 100%. Select all the light layers and hit Control-G to make a group for them. Change this layer mode to Linear Dodge 100% and add a Channel Mixer adjustment layer to turn the color's effect to a light purple. Create a new layer below the light 1 group. Use a soft brush with the color #fad8fa and Opacity about 30% to paint highlights on the model's eyes. Open the light rays images pack. Select one image you like (I've chosen the red one) and move it onto the model's head. Use the Free Transform Tool (Control-T) to change the perspective of the image to make the light rays come down from above. Change this layer mode to Linear Dodge 100% and use a layer mask to remove the hard edges and unnecessary details around the head. Duplicate this layer and flip it horizontally (Edit > Transform > Flip Horizontal). Paint on its layer mask to remove most of the light rays, leaving some visible on the left side (from the viewer's perspective). Add a Color Balance adjustment layer to vary the light rays' color. Open the light 1 images pack. Select image 012 to add to the model's face, and change the mode to Linear Dodge 100%. Use Control-T to rotate the image to make the highlight spot of the image appear on the top of the light rays. Use a layer mask to remove most of the image, leaving some light and color effects visible mostly around the sides and top of the model. Use a Color Balance adjustment layer to alter the effect's color a bit. Open the light 2 images pack. Select image 5 and add it to the main canvas, and then alter this layer mode to Linear Dodge 100%. Use a layer mask to remove the hard edges of the image, making the effect visible around the model's face only. Create a Curves adjustment layer to make the effect brighter and more visible. On this layer mask, paint on the lower part of the left side and the face to make these areas less affected by this adjustment layer. Make a new layer on top of the other layers and use a soft brush with the color #bf4d83 and Opacity about 30% to paint on the upper section of the model's face. Change this layer mode to Linear Dodge 100%. Open the abstract texture image and drag this image onto our main document. Set this layer above the model's layer and below the eyes one. Use the Liquify Tool to tweak this image again into many different forms and arrange them around the model and light circle. Use your imagination, and don't stop until you feel good! Create a group for these layers, and change this layer mode to Linear Dodge 100%. Add a Hue/Saturation adjustment to change the color of the effect from red to yellow. On the layer mask, paint on some details to make them less affected by this adjustment layer. Use a Curves adjustment layer to reduce the effect's visibility. Download the planet with the angle you want, or use your own resource. Place the planet onto the light circle and duplicate them twice. Use Control-T to change their size and arrange them around that circle. Set the planet layers below the light groups. Make a Color Balance adjustment layer and alter the Midtones settings. On this layer mask, paint on the shadow area of the planets so they won't be too blue. Use a Curves adjustment layer to bring more light to the front of the planets. Paint on their shadow area to keep their lightness and contrast. To create more details and texture for the sky, open the space background 2 image pack and choose image 3 (or any image you like or your own resource). Drag it into the main canvas and change the mode to Screen 100%. Set this layer on top of the other layers. Make a Levels adjustment layer to decrease the effect's visibility and lightness. Create a Gradient Map adjustment layer on top of the layers and pick the colors #a58869 and #94ece5. Change this layer mode to Soft Light 90% and use a soft black brush to paint on both sides of the landscape to reduce the effect of this adjustment layer. Add another Gradient Map adjustment layer and pick the colors #808080 and #bbccee. Alter this layer mode to Hard Light 70% and paint on the model's face to reduce the brightness there. Make another Vibrance adjustment layer to enhance the effect more. Paint on the top of the landscape and the lower part of the model's face to make sure they don't become too blue. Create a new layer and use a soft brush with the color #200120 to paint on the lower part of the canvas to produce some reflected light there. Change this layer mode to Linear Dodge 100% and use a layer mask to reduce the effect's visibility on the lower area of the scene. Use another Curves adjustment layer with the same purpose. Paint on the lower section so it won't be too magenta. Add another Curves adjustment layer to brighten the left part of the model and the light circle. Paint on the rest so it won't be affected by this adjustment layer. You can turn your selfies into cool digital art! Today, you'll learn how to create this galaxy manipulation using a selfie and a few free stocks from Pixabay.